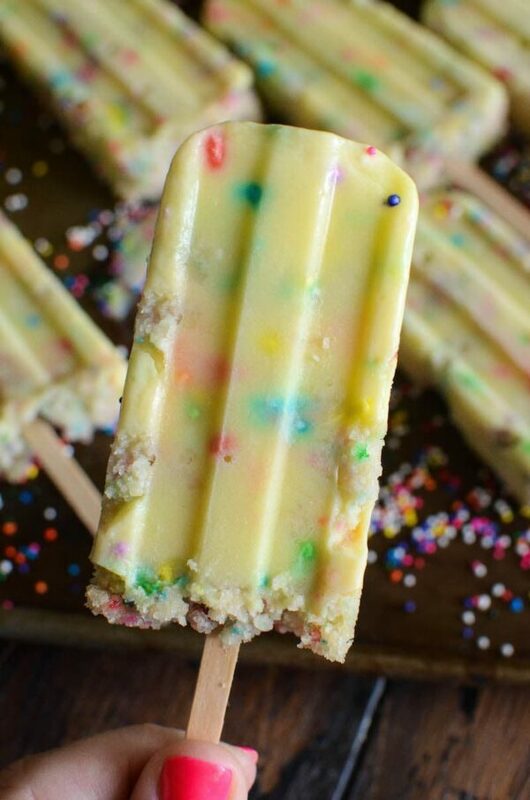 Funfetti Cake Pudding Pops: quick creamy sweet vanilla pudding pops are stuffed with rainbow sprinkles and bites of funfetti cake you bake in the microwave! Remember funfetti cake, also sometimes called confetti cake? How about pudding pops? 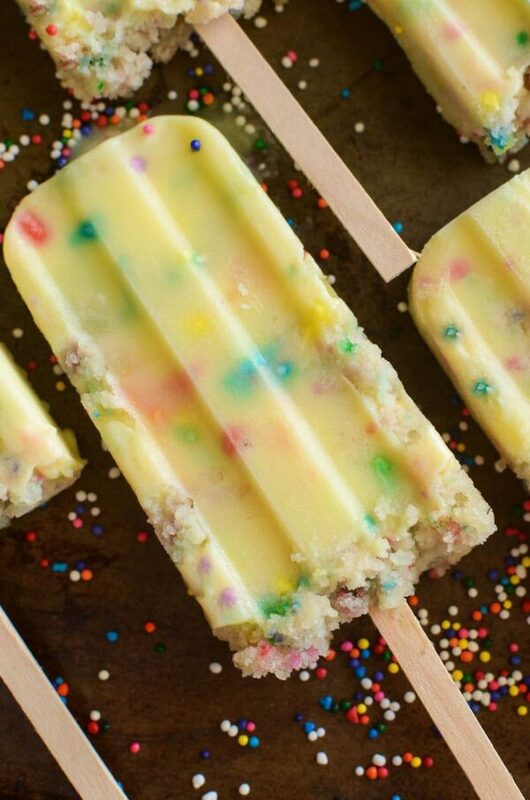 Imagine those two childhood favorites combined and you get Funfetti Cake Pudding Pops! 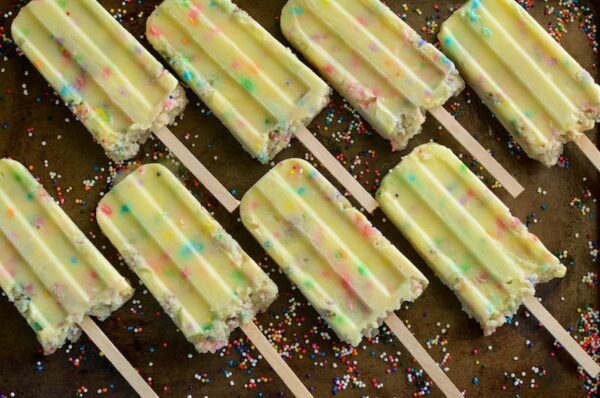 I had seen some funfetti pudding pops floating around pinterest, but they were all just plain pudding pops with added rainbow sprinkles. Where was the cake?? I needed actual bites of cake in mine! I didn’t want to bake a whole cake just to crumble it up into popsicles. Who has that kind of time? Not me, or any other mama with kids at home this Summer all under foot! So I whipped up a quick funfetti mug cake recipe. To dry of a cake would have not frozen as well and so I tried out a few options. It took me a couple of tries, but I finally found the perfect moist crumb texture I needed to add to the pudding pops for freezing. The girls and I were both gobbling up the pudding mixture and cake bites and so we only ended up with half a batch to freeze into popsicles! With the use of the microwave and instant vanilla pudding, these Funfetti Cake Pudding Pops only take about 15 minutes of total work. The kids can absolutely help make these and everyone will love eating them! Watch the video below to see how quickly they come together. The hardest part is waiting the four hours for the popsicles to freeze! Similar recipes I think you will love! These are so fun!! I love that there’s actual cake int hem and they’re ridiculously pretty! These would be perfect for any celebration! What a fun summer treat! I love the hidden surprise of actually having cake crumbles in it! These are the ultimate summer treat (especially when you have 4 summer birthdays in the family)! Groovy, my kids would love these! I wish I had one pf these pops right now! Pudding pops are so good! These are so much fun (pun intended), and look refreshing. Seriously I am in love with this popsicles, it looks so yummy. I was waiting for this from very long time and finally, i get it. Thanks for the post.